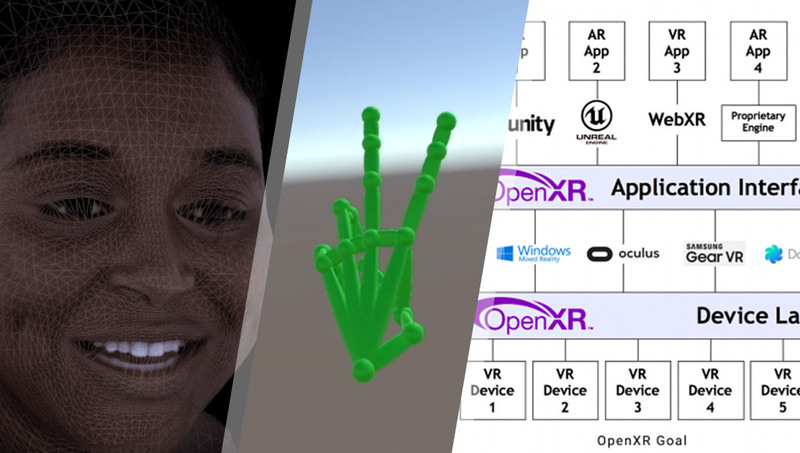 This week, we have a crazy realistic avatars from Facebook researchers, a new Vive hand tracking SDK, the release of OpenXR 0.9 for devs to try out, wireless PSVR2 hints from patents and more! Facebook researchers’ “codec avatars” are incredibly lifelike — hopefully we’ll have avatars at this quality level sooner rather than later! The Vive team’s new SDK tracks your hands, gestures and on the Vive and Vive Pro tracks your fingers with 21 point tracking. Oculus Quest is wire-free and so you’ll be able to flail to your heart’s content! Sony will have wireless VR coming for you too, so maybe Beat Saber will emerge there too some day. OpenXR aims to solve the issue of XR fragmentation — OpenXR 0.9 was released for evaluation by developers and implementers in the industry. A nice idea to try to educate teens using emerging tech. It may help older people with balance problems or help with post-illness rehabilitation. The headline is super clickbait-y, but it’s actually a curious concept — Palmer Luckey is using VR and sensors to help in real military combat through his company’s Project Maven initiative. Business Insider have a bunch of reports out on emerging tech, this one looks at how VR can provide value to retailers and brands in sales, employee training and product development. I’m not even sure whether a description is necessary here. Welcome to the future. This is a very valuable concept for a hackathon! Blake Harris answers Dean Takahashi’s questions about his book on the founding, acquisition and launch of the Oculus Rift, VentureBeat had more questions for him here (It’s a good book! Worth a read!). Orbus Online is totally rebuilding their initial VR-based MMO that they built after their Kickstarter campaign, it’s rereleasing in April. Who needs expensive lawsuits when you can battle each other in VR instead. Problem solved. It’s a curious tool which also provides heatmaps to track where people look within your content. A nice look at how the Mirage Solo standalone headset came, of all places, from Lenovo. Sad news… Google’s Oscar nominated, Emmy award-winning platform is closing after 6 years. Wishing Google would keep this going. Such a shame! Apparently, the GTX 1660 is 68% faster than the GTX 970. “Developers of Oculus Rift games made with the Oculus Unity plugin can now add Windows MR headset support with their existing code”. I guess there’s no doubt they’re working on these now huh? Forbes had a really good three part series on Magic Leap after some interviews with the founder. Torch is integrating 6D.ai’s AR Cloud platform into its mobile AR prototyping tool. This app available on Android and iOS “creates an AR portal through which you can view a re-creation of one of Rembrandt’s most famous paintings”. You know you want to make AR puppet videos. Spatiate wants to bring the ability for Magic Leap One, iPhone, iPad and Android users to collaborate remotely on virtual artwork. Verizon has also reached a master reseller agreement with Vuzix, an AR headset focusing on enterprise. A curious article about “liberating bodies from the malpractice of desktop metaphor”. What this company are doing with their smartglasses is exciting and makes me want a pair immediately to try out! More details on the HoloLens 2! A look at the Google Maps AR feature for those who don’t have access to it themselves! I think wearables and smart assistants are a great match! Note to self: clean my Fitbit soon. What the differences are between the two! Q, the world’s first genderless voice assistant, wants to end gender bias in virtual assistants. “Researchers propose a simple imitation learning framework that uses eye movement data to train AI software development agents”. Scientists found that caregivers wanted the robots to support positive moments and lessen caregivers’ emotional stress by taking on difficult tasks. All of that was inspired by jellyfish! New York-based ID R&D claims its technology “can detect a range of events, including calls for help, screaming, moaning, and audible alarms”. “A robot claw inspired by the pistol shrimp packs such a fierce punch that it could generate plasma more effectively underwater than lasers”. Let’s help robots both master science and a powerful bunch, that sounds like a great future huh? In case you were wondering how you were going to handle the punching. Researchers are developing a new type of bipedal humanoid robot capable of doing gymnastics too. A new study looks at how well the Apple Watch has managed to afib detection to the masses. It doesn’t just need happy sunny days to function. TomTom, the GPS device company, is “going all-in on autonomous cars”. “Demis Hassabis founded a company to build the world’s most powerful AI. Then Google bought him out”. This article by Hal Hodson looks at “who is in charge”. “Optimistic visions of AI won’t come to fruition unless the technology’s many challenges are address, according to thought leaders like Eric Schmidt”. They’re looking to use machine learning to help remaster “Star Trek: Deep Space Nine” in 1080p — now that’s a good use of AI! “AI and quantum computing research are coming together in fascinating ways. Quantum computing isn’t here yet, but investments in it already paying dividends”. It looks rather odd but is quite effective and affordable! “Democratic presidential candidates are talking more about AI, as it appears intelligent machines will become an issue in the 2020 race”. By the end of this month, this is apparently going to be getting use! A pretty interesting take on the street writing robot! Apple are aiming to improve Siri in a range of ways based on their recent acquisitions, this is the latest one which focused on a personalised “interest search engine”. Give your drone a break by letting it chill out on a tree or two confusing all those birds next to it. A very great use of AI tech to help those who need it using tech available right now. Blind and limited vision people can now use touch to explore the objects and people in photos using this from Microsoft too! This is tech I can get behind for sure! Not needing the internet to use voice recognition is pretty handy — as long as you need it to do something that doesn’t use the internet! I put together a basketball scoreboard that automatically senses your score using a Raspberry Pi 3, Node.js and an ultrasonic sensor for this piece at SitePoint. This mask just looks amazing. Hackster looks at the “race going on to shape our future”. Here’s an interesting DIY project to try out! NXP are looking to find a way to make NFC more secure. Your own desk will just not feel quite as smart by comparison. “The Internet of Things Cybersecurity Improvement Act wants to make sure the [US] federal government isn’t buying devices that can be easily hacked”. All About Circuits looks at “how mesh networking, with low power needs and fast deployment, may be crucial in IoT and automation”. If you have more than 10 smart home devices, “you are courting a level of complexity that will burden you rather than make your life easier”, according to a new report from TrendMicro which Stacey Higgenbotham looks into. Hopefully they keep their word, but many are very worried their data will soon be used for all sorts of things. “Maxim’s new microcontroller supports a wide supply-voltage range and consumes 0.2 µA in low-power mode”. Synaptics makes the tech behind smartphone touchscreens, automotive displays, voice-enabled smart speakers and VR.